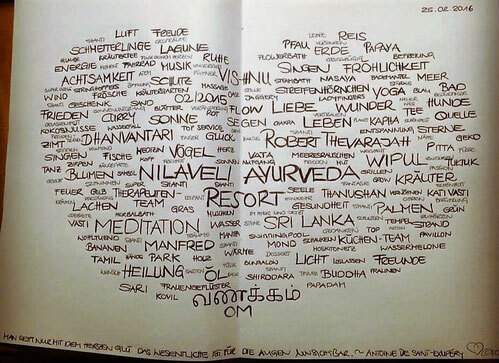 Elisabeth: After a very warm welcome I feel well pampered all around the clock over here in the Ayurveda Center. Your staff is totally competent, friendly and sincere. The surroundings are beautiful. Anastasiya from Russia: This place and these people have opened my heart and did everything that make me happy! Absolutely right to choose the place under the laws of feng shui and the right energy. The location is ideal for the recovery of health, yoga and rehabilitation, spiritual enrichment. Two professional doctors to help the reconstruction and rehabilitation of adjusted daily nutrition, yoga, Treatments, and therapeutic massages. The resort has 10 bungalows with a personalized and attentive level of service. That Resort is located on the coast of the stunning lagoon that has a positive effect in the recovery. In the lagoon you can see many species of birds - eagles, herons and many others. Prior to the ocean, you can walk 3 min, if necessary. People come here for recovery of health or just to relax and get health. The staff did everything that I became realy happy and they did it :) thank you!